Well, my friends, the Olympic Closing Ceremonies have come and gone, which means that it’s time to get back to our regularly scheduled programming both here at The Blog of Funny Names and in my living room. So. What does amb watch once her favourite Canadian athletes have left her television screen (but not her heart!)? Oh, I’m so glad you asked. My aforementioned heart is an incredibly geeky one, which you’d know if you’ve visited me here before. But the truth is that I still haven’t confessed my deepest darkest television viewing secrets. I happily tell embarrassing stories on my home blog all the time, but I still try to keep some semblance of cool around here, because this is Dave’s home blog, and because one of these days I’d like one of my marriage proposals to stick. However. Now that the Olympics are over and I’ve found myself turning to my guiltiest pleasure television show to fill the giant maple leaf shaped void in my heart, I’ve decided it’s time to come clean. I can’t stop watching Pretty Little Liars. What, you mean this isn’t a realistic depiction of high school? I know. I’ll give you a moment to compose yourselves. A clique of teenage girls drift apart after the group’s leader, Alison DiLaurentis, goes missing. Her body is found and the girls are reunited at her funeral. All four begin receiving text messages from the mysterious ‘A’, who seems to know many of the group’s deepest secrets …The girls join forces against A’s scheming and try to uncover the mystery of Alison’s death. Sigh. So not appropriate viewing for the future Dr. Mrs. Carlson, but it’s too late now; I’m hooked. The only redeeming factor in all of this soap-opera-murder-mystery-teen-drama-schmaltz is that my favourite character has a really, really, funny name. Spencer Hastings is the brains of the girls’ operation; she takes AP physics, does enough after school activities for the rest of the clique combined, and is determined to be accepted to an Ivy League college, no matter how many dead bodies keep inconveniently popping up between classes. She’s played by actress Troian Bellisario. Hmm. The girls aren’t the only ones showing a lot of leg. Show business runs in Troian’s blood: her father is producer powerhouse Donald P Bellisario. Donald is, among other things, the man behind the mustache: he produced “Magnum: P.I”. Troian got her start in her father’s tv movies and mini-series when she was just a toddler; she made the jump to more adult roles in “Quantum Leap” (see what I did there?) and independent movies, and has been scheming her way through high school in “Pretty Little Liars” since 2010. I started this post talking about how I supported my country during the Olympics, so I’ll bring things full circle and finish with an equally patriotic defense of my viewing habits: “Pretty Little Liars” is shot in Vancouver, British Columbia. So by watching, I’m actually doing my part to support my country’s GDP. Would rather spend time in TV land than Corporate World. Writes at wordsbecomesuperfluous.com and wishes she was more like Ingrid Bergman. This entry was posted in funny names in tv and tagged ABC Family, amb being a geek, amb's imaginary boyfriends, embarrassing stories, guilty pleasure television, high school, Magnum PI, Pretty Little Liars, teen drama. Bookmark the permalink. d@mn skippy I’m not. That guy is too hairy–like an ape. Though he seems nice enough. And he’s an avocado rancher, so that’s good. Avocado rancher? My two favorite things paired together? Bless you, Liz. Haha, I love the new things I learn on this blog. Tom Selleck is an avocado rancher. Wow! I love that I can just leave you to your own devices around here and y’all just chat amongst yourselves. 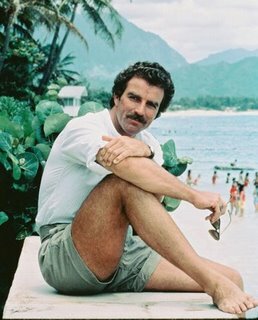 And about Tom Selleck, yet! Such happiness. May I tell you how much I love, “So by watching, I’m actually doing my part to support my country’s GDP.” It nearly made me snort tea out my nose. Did it ?!? Yay !!! You know that’s always my goal. Appreciate your help with the GDP, and glad that you didn’t have to waste any of that delicious tea! Thanks for stopping by while you’re still recovering, my friend. Glad you’re not too sick for a visit! Sigh. I know. I’m sorry. Love me anyway? So clearly like she’s not really dead and somehow is sending all these messages just to mess with the group to get back at them for that thing they did that was totes not cool at all, right? Right? I suppose it doesn’t matter. I don’t think I’m going to watch (too much of) this one. Great name though, and lovely way to totally naturally connect a primo mustache to the proceedings. Well played, Amb. They, like, totes did this way not cool thing to Jenna (seriously, they call it “the Jenna thing”) and now they, like, so totes have to pay for it (in teen angst and co-ordinated outfits). It’s always a great day when I can naturally connect a primo mustache to the day’s proceedings. Thanks Arto! Ha, it’s nice to put a voice to a pithy remark, eh? Very cool name and hey, don’t be embarrassed. This is so not an imbroglio for you. A person needs to get her kicks where she can. it is clear that you are such a brave nationalist, amb and will do whatever it takes to show support for your country, even if it does involve hours of t.v. viewing.